You're getting another post from me tonight because I'm on vacation and because my to-be-written-about inbox is getting ridiculous. MiaSnow makes amazing skins, right? She also makes nifty clothing in a style that I've long loved, hand-drawn and whimsical. 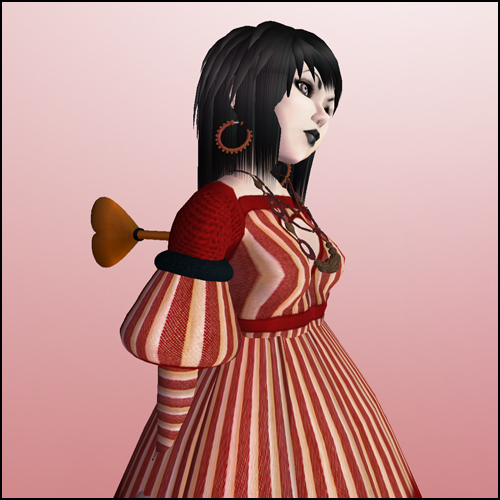 The Broken Heart Bazaar outfit is no longer new (*cough*), but it has red and white pinstriping, a cheeky cut-out heart, poofy sleeves, and a babydoll shape! Mia's clearly slaved over this, tweaking seams and worrying over prims and making sure it looks adorable. The outfit looks especially cute on my dolly avatar, who is pale because unlike me, she wasn't at the beach all day. Yep, my human form is currently a mottled shade of blotchy right about now, and it's because my skin burns and freckles in the sun. I used to be a healthy computer-pallor of white. Now I'm all carcinogenic, like rare meat! Sometimes the lack of physical sense in SL is a godsend. Means that our avatars can feel no pleasure, but damn, they can also get up and brush off from a 1000 foot fall! Note: A new blogger, Dolly Gwynneville, says she's found it tough to get herself onto the fashion feed. Anyone who's got this issue, feel free to shoot me an IM and I'll add your blog to my sidebar as well as post a small pimp. Go check out Dolly! ***Shape: ~All Dolled uP~ Doll Avatar Kit (free at the store). Achariya, thanks so much :) as always i love your blogs... your writing, the pictures! I apologize for not finishing the modesty shirt for the wide open heart dress... and i'm sure i will finish one day. but ahhh, my artist mind takes me where it wants. now i just wish it would take me to the beach! Aw, it's my pleasure, I get to wear neat things! Yeah, join me at the beach !